Courtship in moths can begin as a long-distance relationship. When female moths are available for breeding, they emit a signal that can be detected by a potential male mate 6 miles (10 kilometers) away. What is the nature of this signal? Working over a period of twenty years, in 1959 Adolf Butenandt at the Max Planck Institute in Munich removed glands from 500,000 female oriental silkworm moths (Bombyx mori), and from these glands, located at the tip of the abdomen, isolated and characterized a chemical he named bombykol. When male moths were exposed to bombykol, they wildly beat their wings in a “flutter dance.” Butenandt, a 1939 recipient of the Nobel Prize in Chemistry, designated such chemical factors that trigger a social response in the same species as pheromones. Chemical senses are the oldest of the senses and found in all organisms, including bacteria. In addition to reproductive signals, chemical senses also signal alarm and the presence of predators and food. Once a forager ant finds food, it lays down a pheromone trail that other ants follow to the food. Pheromones produced by the queen bee attract males during her departures from the hive, when she is seeking a mate. (A common pheromone is present in both the Asian elephant and 140 species of moths.) In insects, such as moths and butterflies, males detect pheromones via hairlike olfactory receptors on their antennae. In mammals, reptiles, and amphibians, pheromones are detected by the vomeronasal organ (VNO), located at the base of the nasal septum, and their message is carried to the brain. In 1971, while still an undergraduate student at Wellesley College, Martha McClintock reported that when female college students lived in close proximity, their menstrual cycle became synchronized; this was dubbed the McClintock effect. She also collected compounds from the underarms of women during different phases of their menstrual cycle, which resulted in alterations of the time of their cycles. The validity of the McClintock effect has since been challenged based on methodological and data analyses considerations. Moreover, the actual existence of pheromone molecules and the presence of the VNO in adult humans have been questioned. SEE ALSO: Insects (c. 400 Million BCE), Insect Dance Language (1927), Sense of Smell (1991). Pheromones play an important role in the mating of insects, including moths, where males have been known to travel miles following a trail of a female-emitted pheromone in the air. Pheromone traps have been developed that are used for insect control. 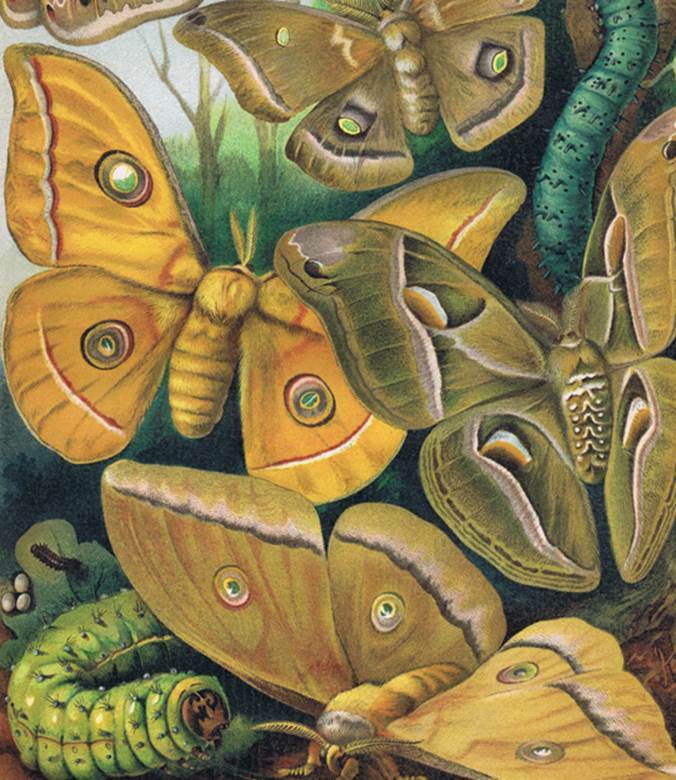 This image depicts the oriental silkworm moths (Bombyx mori) used by Adolf Butenandt to isolate the original pheromone.